If you’re leaving the house today, chances are you will be checking the weather forecast. You need to decide what to wear or if it’s nice enough to walk. But weather stations could be located miles away from your home, providing information that isn’t relevant enough. If you’re a farmer, golfer, researcher, or just a weather enthusiast, this simply doesn’t cut it. If you’re someone who needs hyperlocal information, you should consider a personal weather station. This is a piece of equipment you can install at to your home that gives you precise meteorological data. 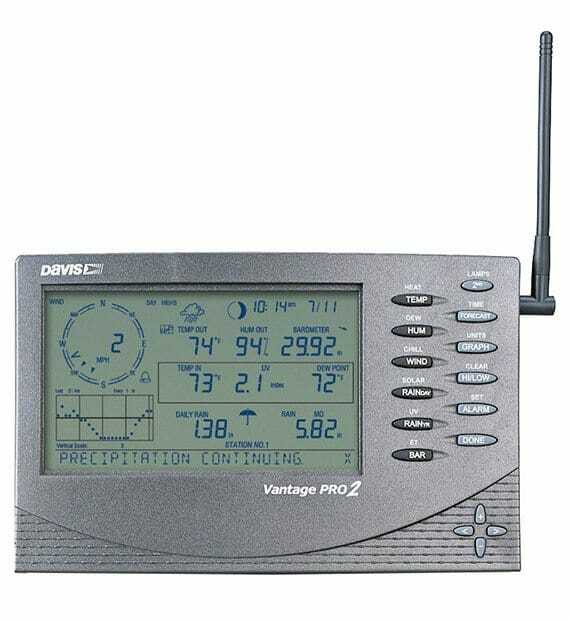 One of your options for a home weather station is the Vantage Pro2 by Davis Instruments. The model promises to withstand any weather conditions that may come its way without compromising accuracy. It comes in both corded and wireless versions. The Vantage Pro2 measures all the essentials – temperature, wind, barometric pressure, humidity – with add-on options for other readings, like UV index and solar radiation. It can also predict weather for up to 48 hours. 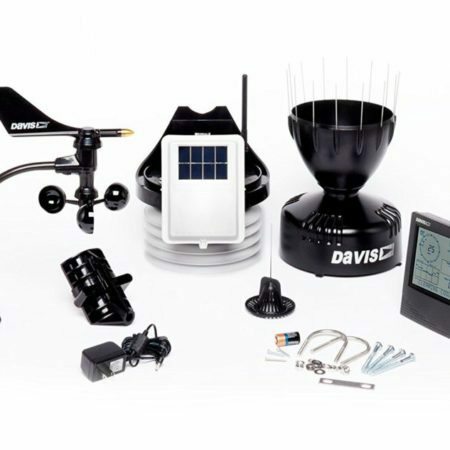 Davis Instruments promotes this as the advanced model in their range. The basic pack makes it possible to measure everything an amateur would need, but it’s the durability and the customizable features that make it attractive to professional users. If you’re a beginner who’s just interested in simple information about the weather, then the Vantage Pro2 offers everything you need. It’s easy to install and use. The pros among you will likely be satisfied with the unit as well, provided you also order the necessary add-ons. If you need to measure soil moisture, for example, make sure you order the attachment separately so that you can set it up with your console. The Vantage Pro2 comes equipped with a console that displays weather information in your home and a sensor suite that actually carries out the measurements. Here are the components you can expect to find with the basic suite. The main selling point of Vantage Pro2 has to be its ruggedness. It can weather any storm without failing. It works both in the scorching sun and extreme cold. This means that it can be used by anyone in almost all weather conditions. The sensors for wind speed and direction are detachable, meaning you can position them separately from the other instruments and in a place where there’s little interference. The device can measure wind speeds up to 200 mph, which is useful to those living in stormy areas. The Vantage Pro2 can measure temperatures from -40°F to 150°F and relative humidity from 0% to 100%. Your console will display both outdoor and indoor temperature and humidity. Since there is some danger of solar radiation causing false readings, you also get a radiation shield. If this is a particular concern for you, you can upgrade this to a fan-aspirated shield that guarantees precise measurements. When it comes to rainfall, the device comes with a collector that measures the amount of water in 0.01-inch increments. This part has spikes that ward off birds. It also empties itself, so you don’t have to worry about it at all. In addition to the above features, you can order additional sensors for your needs. These include instruments that measure UV index, solar radiation, leaf wetness, soil moisture, and others. There are a few additional tricks the Vantage Pro2 has up its sleeve that can be really useful to some users. For example, the console display offers an overview of historical data, making it possible to notice trends. There are even graphs that show analyses of previous weather conditions. The forecast option will also be useful to many as it gives you an idea of what to expect over the next 48-hour period. If you notice something that worries you, you can schedule an alarm. For example, you can set an alarm for winds over a certain speed so that you can react in good time. An especially attractive feature of the device is its solar panel. It powers the station during the day and stores energy for nighttime. In case this isn’t enough, a lithium battery is also provided as backup. Every 2.5 seconds, the readings are updated and sent to the console. That means you will always know exactly what the situation outside is at a particular moment. Provided that the sensor suite and the console are within 1000 feet of each other, the readings can be sent wirelessly. You won’t have to worry about animals nibbling on your cables outside. From the console, your data can be uploaded onto your computer or shared online. You can buy a data logger that uploads readings to your page on WeatherLink.com, where others can access them. There is also an app you can use on your phone, so you can check measurements even when traveling. The kit doesn’t include a tripod or a mounting pole, which most people will need. Of course, you can order these separately, but it would have made sense for them to be included with the station. Another nice feature many would like to see is a camera. For example, if you’re reading the results remotely and they seem strange, it would be useful to have an image where you can inspect the situation yourself. The Vantage Pro2 is pretty intuitive and isn’t too difficult to either set up or maintain. Find a place for it, keeping in mind that you can install the wind sensor separate from the others. This makes sense as you need a place that’s accessible to wind in all directions. The console has a display that’s easy to read. Follow the instructions and play around with it to take full advantage of features like graphs and moon phases. One would be hard-pressed to find a device that has more features than the Vantage Pro2. It offers a lot to begin with, and many other functions can be added to it. If you are looking for a more basic solution that isn’t geared towards professionals, you could consider the BloomSky SKY 2. It offers a camera that monitors its surroundings and the sky, so you can see the weather with your own eyes. It doesn’t offer anything like the functionality you get from more advanced products, but those who just want to keep a closer eye on their local conditions will certainly be happy with what the SKY 2 has to offer. The Vantage Pro2 by Davis Instruments is a versatile and reliable kit that offers most things an average user needs. It’s truly customizable and can become an invaluable tool for research, agriculture, or whatever else advanced operators may use it for. With so many possibilities, the sky is the limit.